`For a long time it has been known that there is a link between TB & nutrition. There is a two way link between TB & malnutrition. TB makes malnutrition worse, and malnutrition makes TB worse. 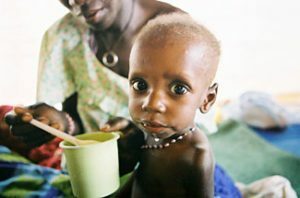 Malnutrition is often considered to refer to people having an insufficient intake of food. But it strictly refers to people having either under nutrition or equally people who have too much food, that is people who are obese. So in the context of TB it is usual to refer to under nutrition, which is people getting insufficient nutrients from their food. Most individuals with active TB experience weight loss. Weight loss among people with TB can be caused by several factors, including reduced food intake due to loss of appetite, nausea and abdominal pain. Equally under nutrition weakens the body’s ability to fight disease. So under nutrition increases the likelihood that latent TB will develop into active TB disease. Although there is a clear link between active TB and under nutrition, in no way does malnutrition or under nutrition cause TB on its own. TB is only ever caused by TB bacteria. Food insecurity and malnutrition in people who are in close contact of a patient with active TB, increases their risk of developing TB. A person with TB should aim to have three meals and three snacks each day to increase the amount of food they eat. There is more about food & TB. There is increasing evidence that under nutrition in patients with active TB is associated with an increased frequency and severity of disease and indeed a two to four fold increase in mortality. There is also a five fold risk of drug induced liver damage. A less than ideal weight gain during TB treatment also increases the risk of long term relapse even after initial cure. Under nutrition has also been associated with malabsorption of key anti TB drugs. So TB and under nutrition can cause a vicious cycle of worsening disease and under nutrition. TB transmission in household: Increased risk of TB incidence in undernourished contacts. In more developed countries, only a few people with TB will need nutritional care & support as part of their TB treatment and care. In other countries, such as India, the majority of people with TB will need nutritional care & support. There are a number of principles for providing nutritional care and support as a necessary part of TB care and prevention and these include. 1. When under nutrition is identified at the time of TB diagnosis, TB must be considered a key cause that needs to be addressed. 2. An adequate diet is necessary for the well being and health of all people, including those with TB infection or TB disease. 3. Because of the clear two way link between under nutrition and active TB, nutritional assessment and counseling are vital parts of TB treatment and care. 4. Poverty and food insecurity are both causes and consequences of TB, and those involved in TB care therefore play an important role in recognizing and addressing these wider socioeconomic issues. 5. TB is commonly accompanied by co-morbidities such as HIV, diabetes, smoking and alcohol or substance abuse, which have their own nutritional implications, and these should be fully considered during nutrition assessment and counseling. Because of the clear link between under nutrition and active TB, nutritional assessment and management are necessary parts of TB treatment and care for many people with TB. A nutritional assessment should be done before the provision of appropriate nutritional support. A nutritional assessment may vary according to the population group. Examples of different population groups are adults (above 18 years), children and adolescents (6 - 18), children under 5 years of age and pregnant women. Nutritional status: Does the person look well nourished or not? Diet and preferences: What is the usual diet and any favorite foods? Current appetite and intake: What is the current appetite and food intake of the patient? If there is none and the patient has little or no intake for many days, it is a matter of concern and may require referral. Food security: What is the situation with regard to access to adequate food for the patient? Is there any scheme related to subsidized food grains, or nutritional supplementation that the family is entitled to? Are they using them? Understanding the impact of TB on nutritional status and the importance of nutritional recovery. The goal of nutritional support is to restore body weight to the desirable range, with the emphasis being on regaining lost lean body mass. However, the effect of nutritional support on outcomes in patients with TB is unclear.